One of the ways how to learn a bit more about particular kind of tea, style or tea region is to stock your tea cabinet with it and then...drink it. Mengku is still kind of mystery to me. Almost all what reach my cup so far have aroused kind of ambivalent feelings. To put it into words I would say "I like it, but I really do not know why, there is not much to like but I do and I want more" To break this down, I decided to go through six Mengku teas in, let say, competition way. No so much in order to label winners and losers. Side by side testing helps me to understand differences and resemblances, Plus, it is always real fun: Sitting, sipping here and there, sniffing for hours - enjoying time devoted only to myself. Plus it is sunny day, so lets spend it with tea outside! There are more ways how to taste-compare more teas in line. I prefer to use small shiboridashis with matching cup. It alows me to make several brews of several teas at once. It can also go as close to "gong fu" as possible. And, with some imagination, you can know how each tea will perform in teapot during more serious tea session. All teas I have here are (according to labels ) from 2006, just one 2005. That is good. To avoid mind-lost, I cut the "competition" in two parts followed by finale. Round number one with three teas from Scott's YS and round number two with 2005 Shuangjiang from TwoDog (the cake was around 70$, sold out few months back), over-famous BingDao from Peter of Pu-ehr.sk (sold out as well. Can you imagine that this cake was around 40$ just 3-4 years back? There is not reasonable exuse for me why I did not buy few tongs back then) and DaXueShan from legendary EOT. Are you ready for the round one? We can put aside names, I think it does not say much to us. Wild Arbor King brick, Wild Arbor King cake (both from BingDao area), Big Snow Mountain Wild...Honestly all that sound to me too good to be 100% truth. Especially if we know that Shuanjiang is tea factory with huge (I heard hundreds of tons) production for each release. It does not mean just that Wild King will have just a part of "wild king" leaves in it, but also that sample does not say much. If my 20g of tea is smoky-bitter it does not mean that ten tons down the road it will be also smoky-bitter. That been said, my "competition" is really more about learning of what Mengku is then looking for the best tea. I can say I like all three samples. Just by dry leaves the "wild king cake" wins, more hairy, unbroken leaves with nice smell. From the first brew, it is clear that teas are really siblings. The "wild king brick" and "wild king cake" should made of the same batch of leaves. Maybe. But the brick is pine-smoky and I am still not sure if I like it. The cake have also more distinct taste. Big Snow Mountain (DaXueShan) performed as more subtle, lighter tea then those "kings". All three have trace of pleasant bitterness. And even if I would read their story on YS site, I would label them as "nice dry stored"
After 8-9 years, leaves are still pretty green. Would you like to hear a verdict or recommendation? Then if you are after mouthfeel and you do not mind light smokiness, then go for brick (it is also cheapest one) If you are after taste and looking for bitterness, go for "Wild King Cake" That would be my choice. If you like lighter, fragrant teas, then give a try to Big Snow Mountain. To this one, I will definitely give it a try in stronger leaves-water ratio! But for now, tamtadada, "2006 Mengku Wild Arbor King Raw Pu-ehr tea cake go to finale! I have to admit that when I put 3g of those teas next to each other, they are so similar that I almost lost the track which one is which. But first brew and all is clear. Taste is very close. 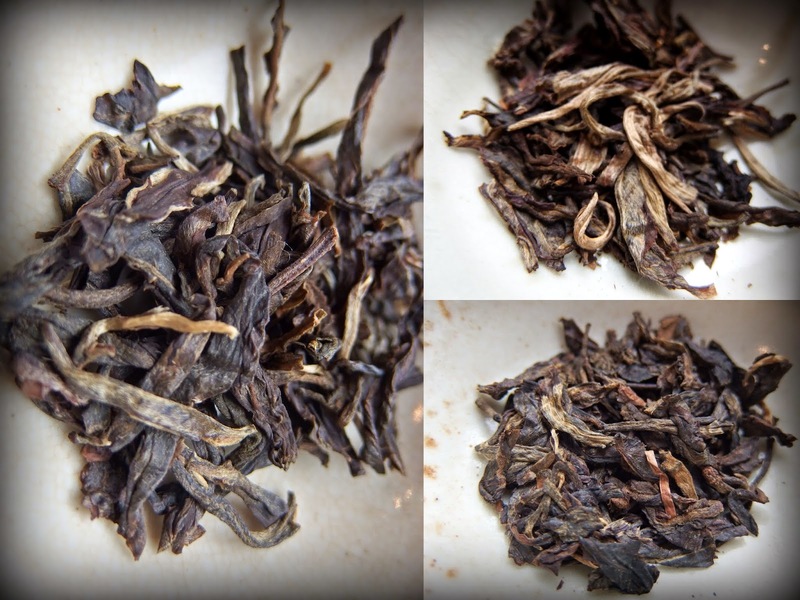 BingDao is finer, "Wild King" more robust. This time I make it stronger with longer steepings. Now I understand the claim on YS site that these teas are sold as fake LBZ. Bitterness and power is there. BingDao from Pu-erh.sk is cleaner, finer tea. Wild King over-role in strength and taste-power. I like this but there is also something a bit harsh. I will probably go for a cake, just to see how this will go in few years. Being tea-drunk while writing these lines, tamtadadadadada, the BingDao is winner here. Smooth, easy for stomach, pleasant for throat but still mysterious and complicated enough to be called shallow. When I was leaving for my first visit of Taiwan last spring, I promised myself to take many pictures, making notes and then share as much as possible here, for my curious readers. Yes, I took over thousand pictures. Yes, I put down some notes about my "pots and tea" experiences. Just that sharing part is missing. My good friend Daniel, who joined me on that trip, just posted some of his notes, memories and pictures on their blog. Thank you Dan! Enjoy the reading here: Tea Lesson with Fang LaoShi. I love that place and there are already some plans to go back, to meet friend over tea, to learn and go deeper. If you will find yourself in Taichung one day, you might want to make some space and stay there for a while. Be sure you are not in hurry, it is worth it. I like when pots call out our imagination, telling mysterious stories. Storytellers who starts to talk, when you hold them in your hands. For my Gem Collection, I always try to select pieces from this category. I also believe that those are going to age well, becoming part of your live. When you make a connection with such pots, by using them for teas you like and sharing that tea with your loved ones, your live is getting richer. It is not about clinging on "stuff". It is about living here and now. Tea creates intimate moments in our daily live and pots become comrades who are with us there. The chawan was painted with white kaolin clay, then covered in crust of ice crackle glaze. Its "ice over a landscape" feeling is one of the reasons why it was chosen as The Gem of summer kiln. Another reason is the white paint and how it is going out of the glaze, letting us to dream, to picture there "our things"
The teapot is even more fogged up. Its spruce forest near peat bog pool. Maybe I am getting too dreamy and wistful thanks to misty rain behind our windows. But if you would hold that pot in your hands you would know what I am talking about. It is not just about the green-khaki color, but as well about the velvet touch of the glaze and its "soft" shape. Before taking look at new gems, say goodbye to gems number fourteen and fifteen. The small Cockerel is already in Shanghai, the Charm and The End of The Winter teapots are going to be on the road soon. I know that all three customers love tea. Those pots are in good hands. For more pictures of the new pieces please visit this page. If the Ten Gems of The Ten Kilns project is new for you, then please read this post first.